The AIDA framework (Attention, Interest, Decision, Action) has not evolved much since it was developed in 1898 to describe the customer path (E St. Elmo Lewis). For the longest time, it served as a checklist for advertising and branding executives when developing a brand or advertisement. Today the framework is outdated and is somewhat too simplistic to inform the journey of today’s always-on, hyperconnected consumer. In his latest book, Marketing 4.0, Philip Kotler proposes a new framework to accommodate changes shaped by technology. His proposed framework is the 5 As model (Aware, Appeal, Ask, Act, Advocate). The 5 As provide a much needed update to the AIDA framework and will be instrumental in developing a full-funnel approach. Below is a brief description of the 5As and a deeper dive into the touchpoints that really matter to the consumer, lifestyle and business-to-business categories. In this phase, consumers are passively exposed to brands, advertising and/or advocacy of influencers, friends and family. When processing the brand messages to which they have been exposed, consumers either create short-term memory or amplify long-term memory. In this appeal phase, consumers short-list the brands that are the most memorable. At this stage, the community heavily influences the initial appeal of a brand. 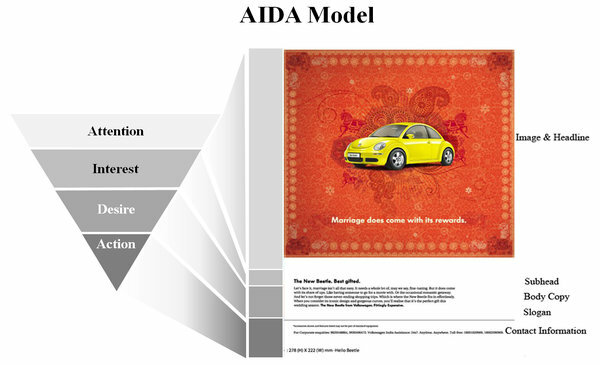 This contrasts with the traditional AIDA model that focuses on the individual. In the ask stage, consumers research brands they short listed by collecting more information from the media, friends and family and the brands themselves. Consumers proactively connect with one another and build ask-and-advocate relationships which ends up either strengthening or weakening the brand appeal. The act stage is not limited to purchase but also refers to the usage of the product and post-purchase services. The advocate stage encompasses loyalty, retention, repurchase and advocacy to others. In a highly fragmented category, a large number of brands compete for millions of customers. The purchase is often impulsive and emotional. To succeed, marketers must particularly focus on upper-funnel branding and price-driven tactics in the lower funnel. Branding must be aggressive to ensure the largest possible share of voice. In the meantime, purchases can be driven by creating urgency and implementing retargeting, among other tactics that prompt an immediate action. Hotels.com exemplifies success in this category. Its character, Captain Obvious, personifies and differentiates the brand from its many competitors in the Online Travel Agency space. At the same time, Hotels.com drives action with ‘deals of the day’, ‘clearance sale’ and other ‘special deals’. In a b-to-b context, the ask is superior to the appeal. The buying process is long, involves numerous stakeholders and the evaluation process is very thorough. Brands that target business professionals must demonstrate a sharp competitive advantage, which they must communicate clearly. Salesforce has been particularly successful at building a meaningful brand through its ‘end of software’ mission. It built its brand on the benefits of cloud computing, while emphasizing that CRM software had become ill-suited and obsolete. Through metaphors and catchy visuals (the ‘no software’ button), Salesforce managed to communicate simple, salient benefits in a category that is complex by nature. In the lifestyle category (luxury goods and services), consumers trust the brand and the quality of its products. These consumers are actively involved in the decision process. Brands that market lifestyle products must leverage word-of-mouth, social media platforms and content marketing to expand their reach. Marketers may also consider brand extension to access a larger audience, while always maintaining the prestige and emotional appeal of the brand. The luxury leather bags, accessories and baggage brand Ghurka integrates customer reviews and pictures into its website. This makes these reviews more authentic, aspirational and glamorous than the plain text reviews found on other ecommerce websites. Both the brand and its customers promote this content on social media, enabling Ghurka to increase its visibility and affirm its values of long-lasting quality, authenticity and adventure. The application of the 5As framework is not limited to the three categories described above. I urge you to look at your brand through the lens of this model and research which touchpoints matter the most to your success. Based on this research, you can then draw your own diagram in the shape of a funnel, door knob, gold fish, trumpet or any other pattern that represents your path to purchase. This adaptation of AIDA, updated to the evolving definition of branding as the relationship with a customer reminds us that we are no longer building a relationship to make a sale, but making a sale to start a relationship.